The fencing team is gearing up for Prep B team championships, which are set for Monday, February 13 at the Ranney School. In the recent district competition, highlights included sophomore Briana Moglianesi advancing to the individual rounds, where she placed eighth overall. In addition, the women’s epee team finished in fifth place and men’s sabre in sixth. Last night, the team faced West Windsor Plainsboro South on the road. While weather kept many GSB fencers from the meet, those that were able to attend stepped it up by fencing in more than one weapons-group. Senior Luke Solondz, junior Danae Aslidis and sophomore Genevieve Caron volunteered to round out the foil squad. 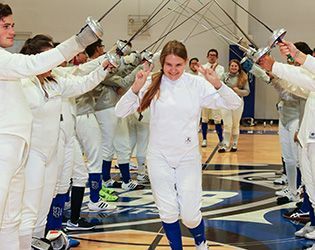 Aslidis became the first GSB fencer to post a victory in epee, foil and sabre competition. On Monday, although both the boys’ and the girls’ teams lost to Hun, the bouts were extremely competitive (14-13 for the boys, 15-12 for the girls). As head coach Elyse Gurnowski offered, "As we gear up for the Prep B Championship, our Knights are ready to beat the odds and are hungry for the win." On another note, the team paid special tribute to its eight seniors on January 19, honoring (boys) Landon Braemer, Patrick Reilly, Jack Riccardo, Luke Solondz, (girls) Cindy He, Mary Fran Howard, Nichole Morley and Rachel Richardson. Best of luck to our freshmen and sophomore fencers in the Montclair Frosh/Soph Invitational this weekend and to all our fencers in the coming weeks.